"Take the Case of That Old Lady with the Diamonds"
By Arthur M(inturn) Chase (1873-1947). 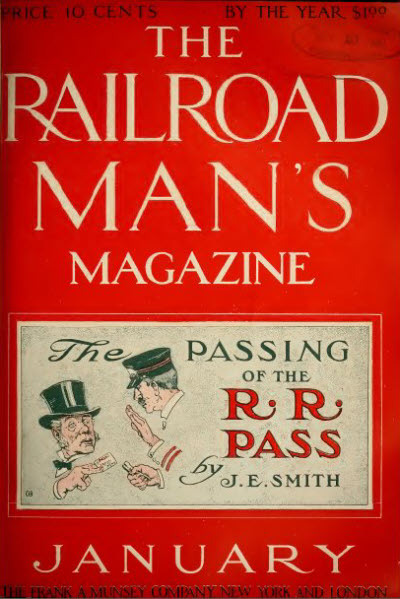 First appearance: The Railroad Man’s Magazine, January 1910. Short short story (9 pages, with 6 illos). 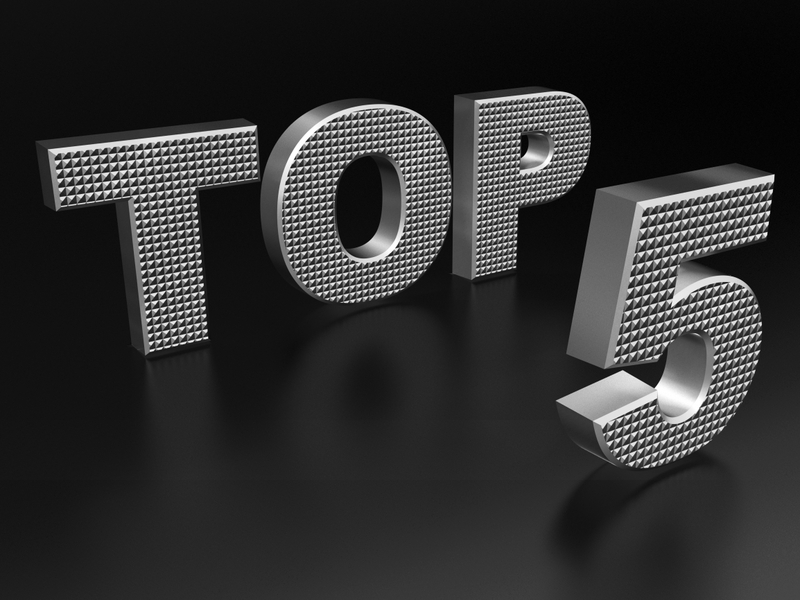 "Sherlock Holmes, Eugene Vidocq, or Arsene Lupin Couldn't Have Kept Track of Them." gency brake, hurls "her whole weight on it, like a drowning man would grab a straw,"
exactly, let's just call it an explanation and settle for that . . .
- Our story takes place almost entirely aboard a Pullman sleeping car; see Wikipedia (HERE) for a brief history of the Pullman and Rails West (HERE) for a much more detailed and hand-somely illustrated account of the Pullman car's evolution. "A badly written tale which, however, keeps your interest, and we don't know why, for every idea and situation in it is threadbare from use. Thirteen people gather on Friday the 13th in a penthouse apartment. Seance, lights out, suspense, scream, lights up, host dead with dagger protruding from bosom. And they can't get out because the big door has blown shut and they can't find the key. So they set to work to discover which of them is a murder-er." — Walter R. Brooks, The Outlook, January 13, 1932 (HERE; scroll down to page 58). "Steve Carrington—a Harvard man, one regrets to observe—used to throw rather catch-as-catch-can parties in The Hermitage, as he called his penthouse bungalow on top of the Madison Building. There, twenty-six stories above the street and in complete isolation, little gatherings assembled; a large paper rose in the living-room was a hint that whatever happen-ed must be considered sub rosa. But on the evening described in this lively mystery story the party was not supposed to be a wild one. The guests were a stockbroker and his wife, an engineer and ditto, and a clever young publisher with his exceptionally attractive consort. There were also the very lovely Mary Parsons; the host's secretary, Mr. Deakin; an Irish baronet called Sir Geoffrey, and Marjorie, herself a writer of detective tales and narrator of this one. And that the number of the group was thirteen, the time midnight, a thunderstorm, a spook seance, a Cellini stiletto, and a green diamond. It was obviously a bad omen when Mr. Carrington, the somewhat sinister host, took to singing Danny Deever in his cups. The tale is well told and makes excellent pastime. 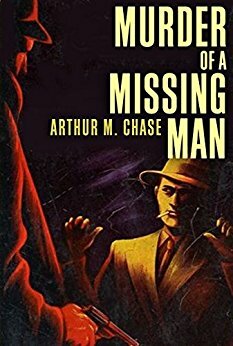 Mr. Chase makes a welcome addition to our native mystery writers." — "The New Books," The Saturday Review, January 23, 1932 (HERE). ". 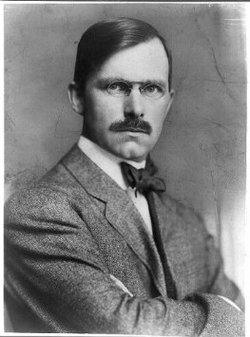 . . Anglophile is a name that causes ructions in writing circles these days, so we turn hastily to 'Danger in the Dark,' by Arthur M. Chase, a tale that takes place, so far as location can be determined, in the confines of the Empire State. Old Mr. Van Tassel—who took a suitcase full of currency to his country villa, hid it in a well, ordered a retreat to New York when his family was attacked by bandits while at dinner, and was found later deep in the well where his money went—is the victim on whom Gene Mallory, writer of mystery fiction, tries to prove his value as a real detective. The village police dismiss the death as an accident, but Mallory knows better and delves into the history of the family and its retainers until he hits the tiny clue that leads to the solution. The story has plenty of movement, and the detective work is honest and aboveboard." 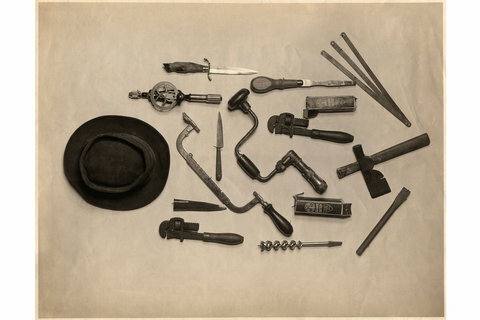 — Walter C. Weber, "Murder Will Out," The Saturday Review, January 21, 1933 (HERE, column 2). 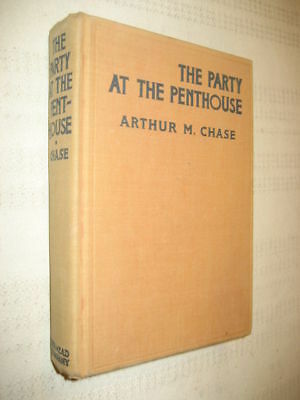 "A detective story involving six people in a murder and theft at a country estate, by the author of The Party at the Penthouse, a very successful thriller. This second attempt promis-es to be equally successful; it holds, mystifies, and entertains." 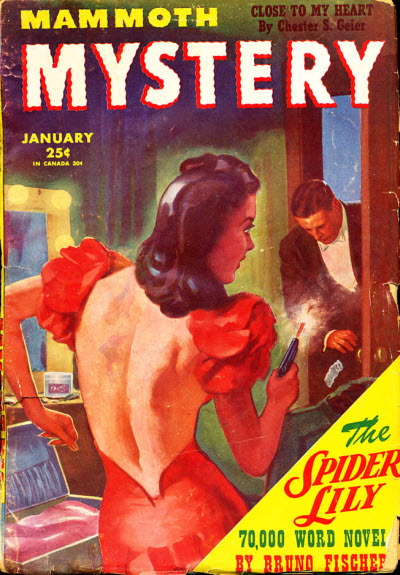 — "The Bookman's Guide to Fiction: Detective and Mystery," The Bookman, February 1933 (HERE). "The Crime Simply Couldn't Have Been Committed at All, but It Was"
(and that's not necessarily a compliment; remember, the scientific idea's the thing, not plotting and certainly not characterization). By Charles S. Wolfe (?-?). 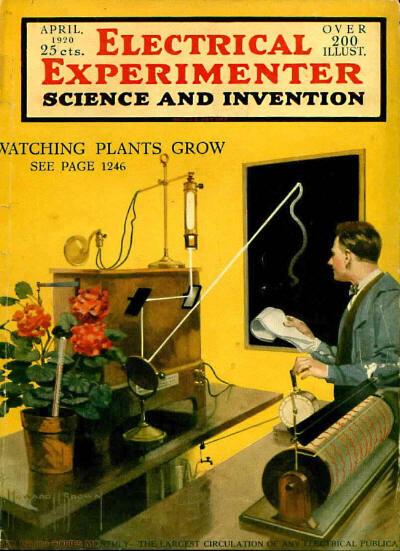 First appearance: Electrical Experimenter, April 1920. 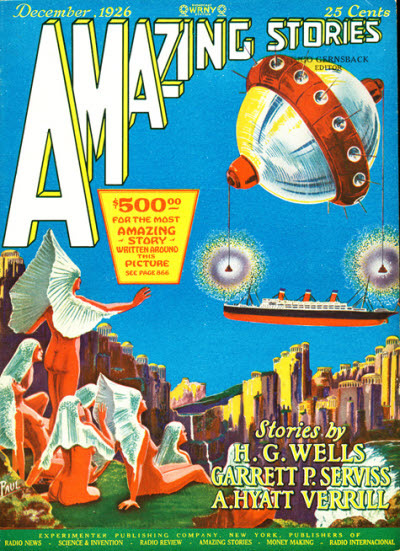 Reprinted in Amazing Stories, December 1926.
and (FINISH: select page 102, et seq.). "Our author Chas. S. Wolfe seems at home with murders and the police. He has a special talent in bringing a mystery before us and in picturing some of the efforts of the ordinary mind, solving it and then in his own gripping way developing all the details so as to bring the story to a conclusion which is a revelation of a mystery. Here is a mysterious stabbing, no weapon to be seen or found, the ingress and regress of the murderer a profound mystery, and we almost fear the very name of the story tells too much, but we know our readers will find plenty of suspense in its text." You've heard of the "magic bullet," but how about the "magic knife"? Comment: This one strongly reminds us of a Dr. Thorndyke mystery, but is far less plausible—and if Gernsback's so concerned about the story's title, what about the illo, Hugo? - Of course the ISFDb hasn't overlooked our author; go (HERE). The bottom line: "Human madness is oftentimes a cunning and most feline thing. When you think it fled, it may have but become transfigured into some still subtler form." "I Mean What Would Be the Good of My Making Passionate Love to You?" 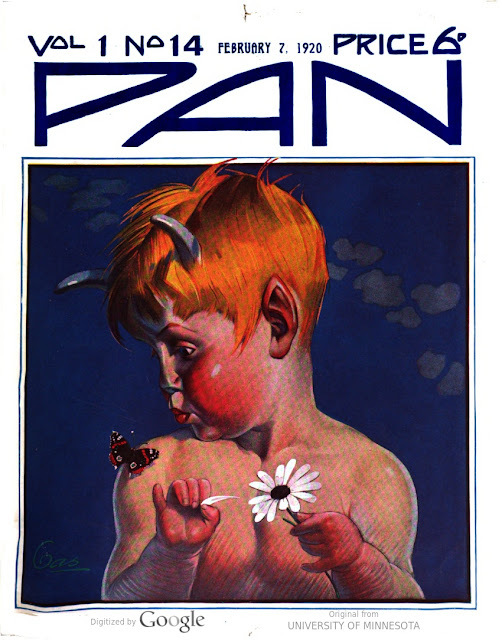 First appearance: Pan, February 7, 1920. "This is nonsense," she said. "You're simply being tyrannised by the story." "But supposing he takes it into his head to poison us or murder us or make one of us commit suicide?" "Here Is the Dusk Again; the Friendly Night!" 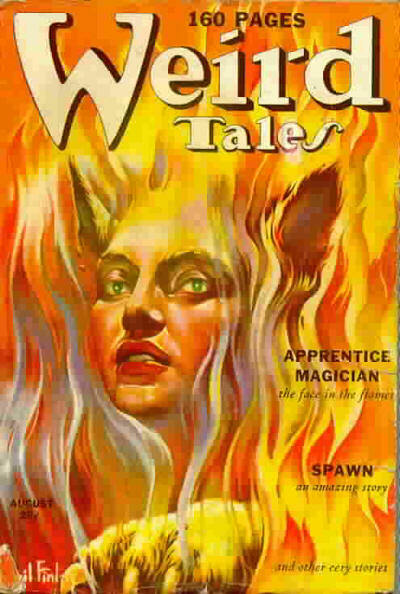 First appearance: Weird Tales, August 1939. Starrett captures the tenebrous milieu in which Poe's intellectual detective and his "Watson," ever eager for adventure, thrived. - The ISFDb has an entry for Vincent Starrett (HERE). - One of Starrett's Jimmie Lavender stories, "Recipe for Murder" (Redbook, November 1934), got badly treated by Hollywood, being filmed as The Great Hotel Murder (1935); see the IMDb (HERE) and be sure to read "User Reviews." By all accounts, a lousy movie. - Our last visit with Vincent was (HERE). THE MOST POPULAR POSTINGS from last month featured a thespian cop, a review of a tribute volume to Peter Lovesey, an adventure with a female Nero Wolfe, a clever story about a safe robbery, and a skyfy tale about the unusual use to which a time machine can be put. You might also note, in skimming the lists below, the continuing popularity in every year of articles that relate to Sherlock Holmes, whose "immortality" seems assured. "In a General Sense, Literature and the Drama Are Saturated with Bandits, Brigands and Outlaws, Sometimes Comical, Sometimes Heroic, but You Will Excuse Me If I Maintain That You Stand on a Different Footing"
By James Harvey Smith (1852?-1925?). 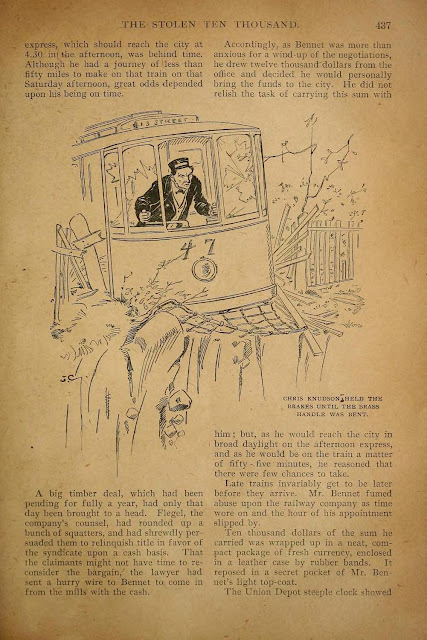 First appearance: McClure's Magazine, August 1893. Short short story (9 pages, with 10 illos). 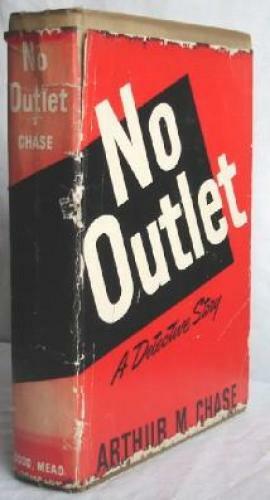 Online at Project Gutenberg (HERE) and UNZ (HERE). "What is your annual income as a burglar?" they encounter the homeowner and make the crucial mistake of underestimating him . . .
"In the Desert," Munsey’s Magazine, February 1899. 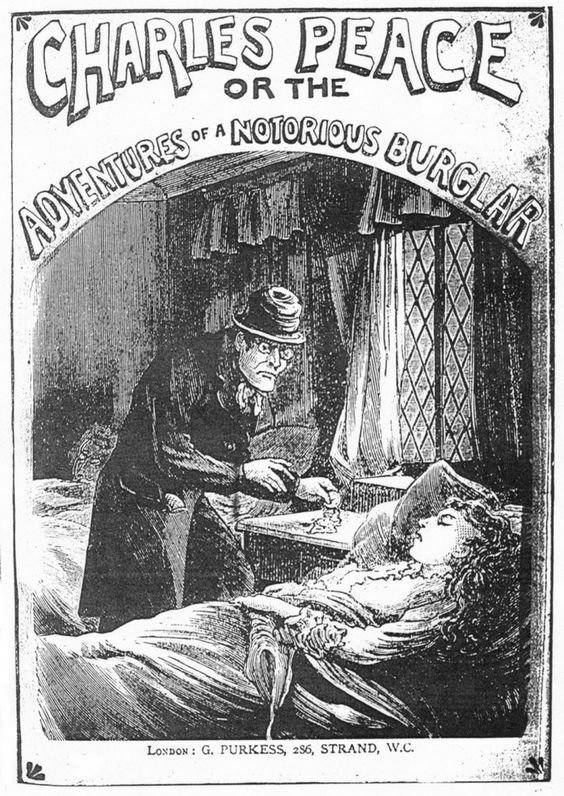 The penny dreadfuls just couldn't help themselves when it came to glamorizing burglars. 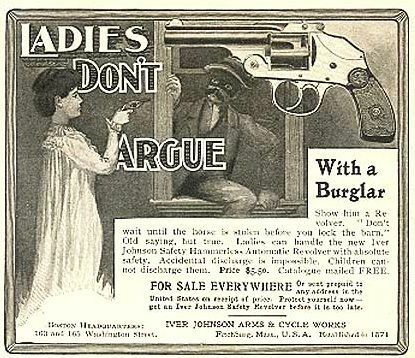 The bottom line: "Actors and burglars work better at night." 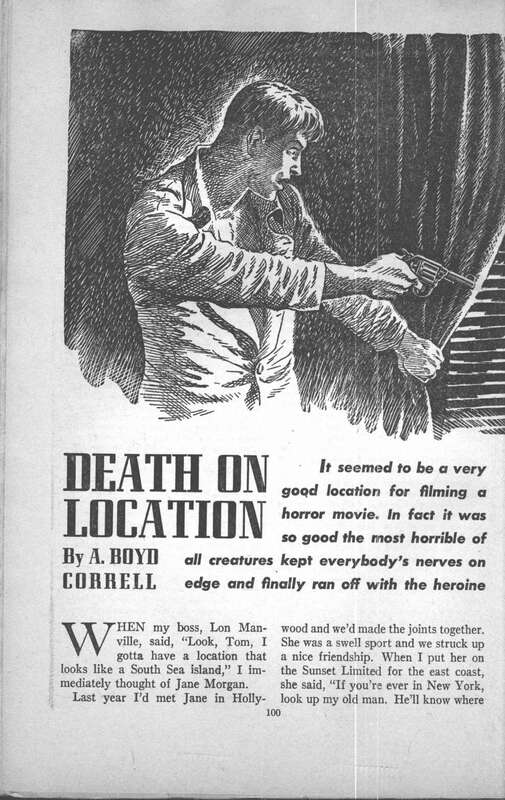 "We Jumped Him Before He Finished You Off, Though I’ll Admit It Was Close"
AUGUSTUS BOYD CORRELL, according to FictionMags, was "born in South Carolina; Newspaperman, writer for Walt Disney, author of magazine short stories; died in Los Angeles." In 1948 he co-authored a novel, The Dark Wheel (a.k.a. Sweet and Deadly), with Philip MacDonald (briefly noted HERE; criticized HERE; and online at Hathi Trust HERE). Our author also wrote this one; we wonder what's in it. 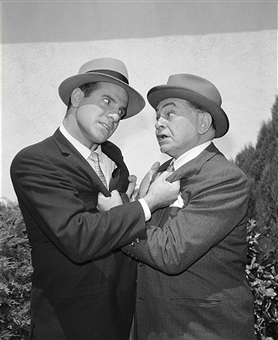 Correll put words in Edward G.'s mouth; Tige Andrews (left) horsing around with Edward G. Robinson on The Detectives. "A Motive Was Shaping Itself in My Mind, but I Couldn't Tie the Strings Together"
"The Corpse That Played Dead." 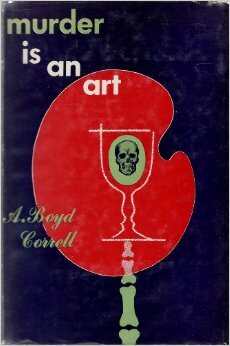 By A. Boyd Correll (1905-87). 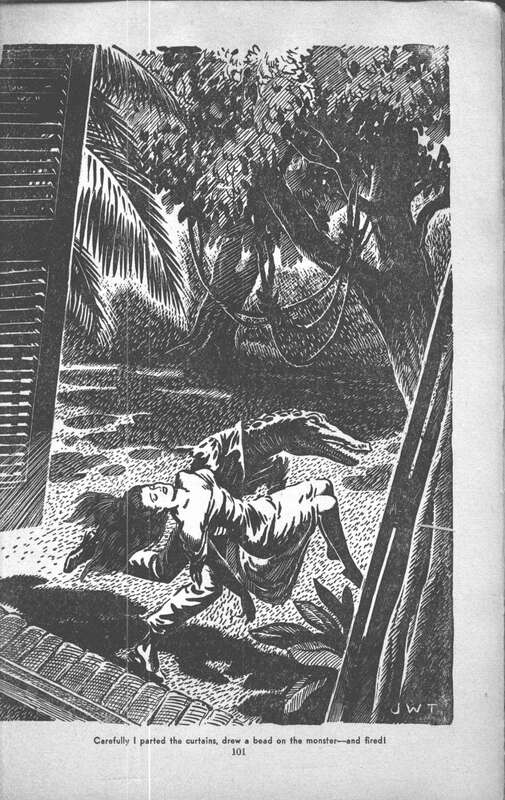 First appearance: Thrilling Mystery, Winter 1943. 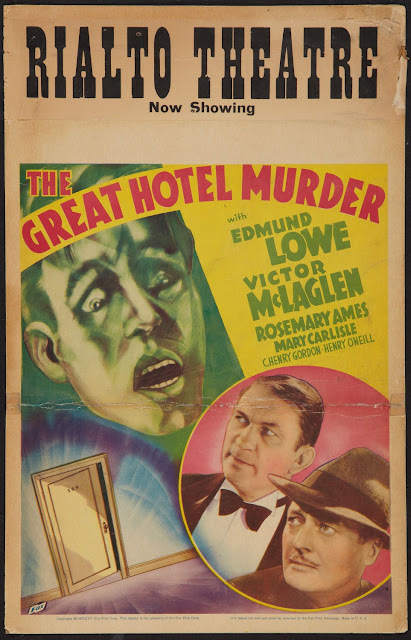 "Murder Closes Down on a Hollywood Lot When a Pompous Actor Gives Up the Ghost in the Midst of a Machine-Gun Melodrama!" "I jumped up from the pile of scenery and started for the prop bridge, with Jane and her brother close behind. I leaned over the actor. A dark red worm of blood was jerking and twisting from his temple, and his throat moved convulsively. He sighed and gurgled. Then the blood stopped jumping, and merely seeped as though no more was left in his body. . .
"As I started for the door, the background lights, casting their eerie glow of red, suddenly blinked out. The stage was in total darkness. I let out a yelp of surprise, and was smacked flat as someone rushed past me. Jane screamed—a long, piercing cry that echoed and reechoed through the building. across the floor, then a bump—and silence. . .
"I started, when I glanced at the spot where the corpse had been. The body was gone." "One moment he wasn’t there, and the next he was. In the ghostly light of the background flares, he looked like Scrooge and the devil rolled into one. His withered leg swung like a pendulum between his good one and the mahogany crutch which supported him. His head, a tremendous load for such a scrawny neck, was covered with a fuzz of colorless hair. His ears were pointed, and belonged on a character from a child’s fairy story book. 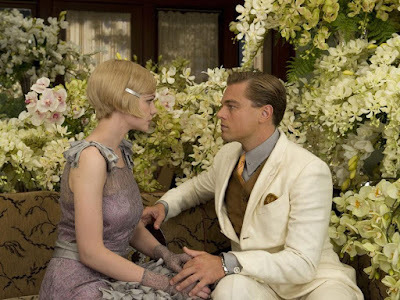 I had seen him often, but I was always startled when I faced him." 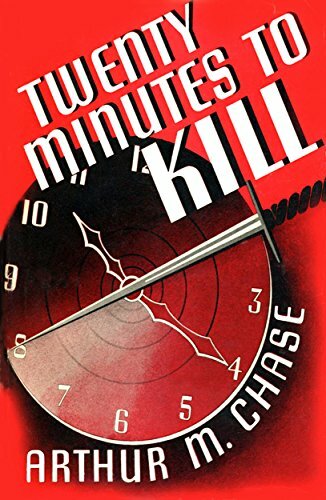 - As mystery writers love to tell us time and again, making movies can be murder; take, for instance, "The Adventure of the Sinister Scenario" that Ellery Queen and his dad get to have (HERE) and (HERE). "Some Refugee from Frankenstein Dragged a Girl by My Window"
First appearance: Mammoth Mystery, January 1946. 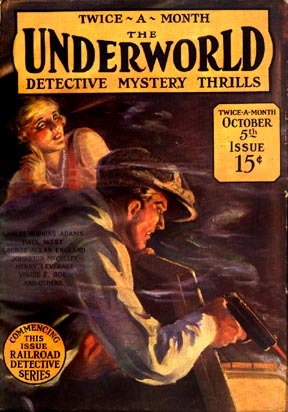 Reprinted in Pulp Tales Presents #24, August 2011. Online at Comic Book Plus (HERE) (select page 100). "It seemed to be a very good location for filming a horror movie. In fact it was so good the most horrible of all creatures kept everybody's nerves on edge and finally ran off with the heroine." Tom Ferguson's normal occupation is scouting for movie locations, but when he embarked on this particular expedition he never anticipated finding an old woman with her throat torn out—or getting attacked by a swamp monster that walks on two legs (a "gibbering thing that smelled of putrefied flesh"), a creature straight out of a nightmare that, oddly, seems a mite too protective, not of its territory per se, but of some small shiny, round things that your average monster wouldn't think twice about, but which would definitely excite human interest, enough human interest to lead to murder . . .
"I Had It When I Stepped on This Car, You Grinning Donkey, and Some One on This Car Has It"
By D. C. Freeman (?-?). 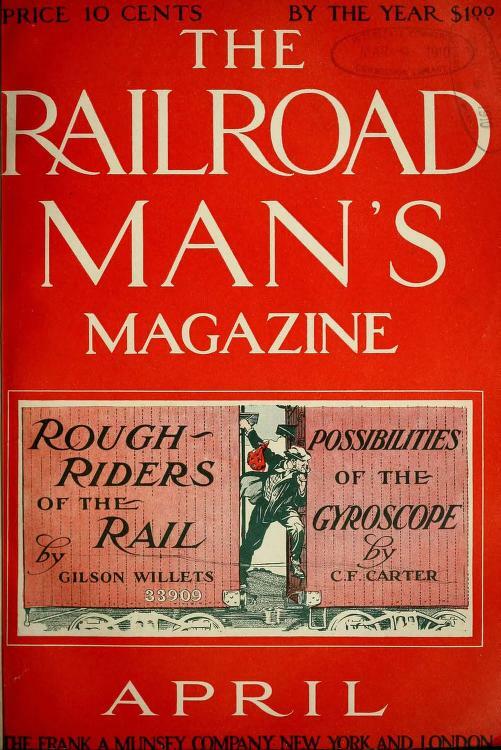 First appearance: The Railroad Man's Magazine, April 1910. 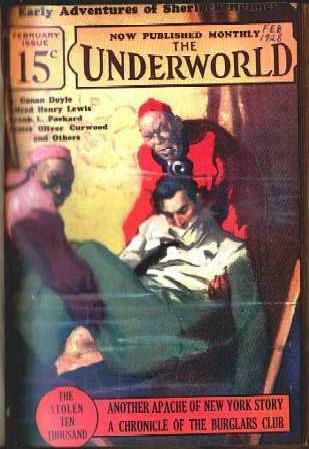 Reprinted in The Underworld, February 1928. "What Happened on the Night That Denver Joe Made a Haul in No. 47, the Hoodoo." Persons abroad on the streets were appalled by the remarkable vision of the veritable chariot of fire winging its way recklessly through the public thorough-fares. And how, you might reasonably ask, could such a thing transpire on the avenues of a large American city? We could go way back to Denver Joe's early years, when at some point he must've decided that he's entitled to other people's money whether they like it or not. Or we could go back to just recently, when Shorty Saunders—conscientious bill-paying family man, trying to overcome "an instalment indebtedness doubling up on him, and the missus and the kid both sick for a time"—fails to persuade his superintendent to give him a better street-car route. Or we could say that Shorty's "cold-blooded" Superintendent Skinner simply refuses to cut him any slack. Or we could point to that "bad case of nerves" that plagues Mr. Ambey Bennet—"head of Bennet Lumbering Company of Bridal Veil Falls"—leading to "irritation [that] had been at the boiling point for hours" and causing just enough distraction to induce him to lose track of "a neat, compact package of fresh currency" worth ten thousand dollars. Or we could blame it all on old No. 47, known to a legion of tram car drivers as "the hoo-doo," a street-car with a "reputation for mishaps, and for hurting her motormen and conduc-tors [that] dated back to the days of the single-truckers and the old rheostat," including one memorable trip "with 47 and a trailer with a picnic crowd" during which "the hoodoo scared a hundred people into teetotalism on the way home by trying to peal through the span braces of the bridge." Or we could simply acknowledge what should be obvious, when you think about it: All of those things will combine to produce that mind-blowing apparition of a "veritable chariot of fire winging its way recklessly through the public thoroughfares." - All we know about "D. C. Freeman" is that he or she wrote "The Stolen Ten Thousand," which by a wonderful coincidence happens to be the story we just read. 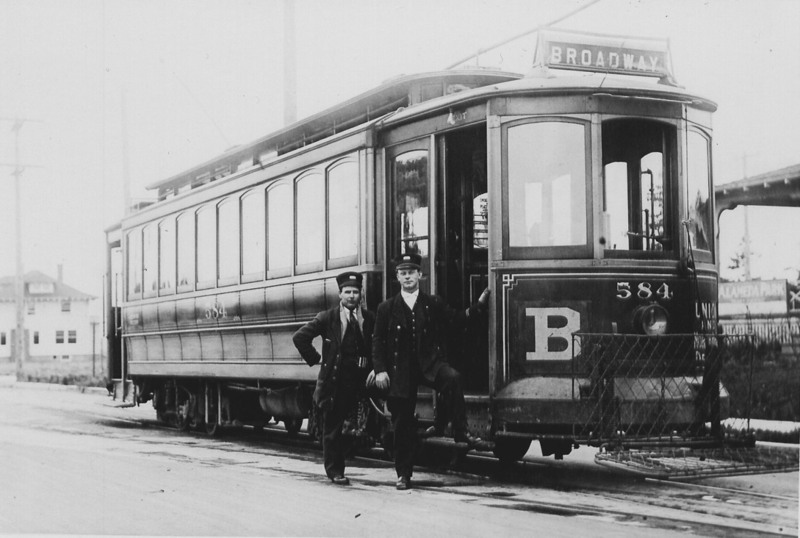 - "Trams," "trolley cars," "street-cars"—depending on where you live, they're all names for the same thing; for history and background on this charming mode of transportation see (HERE), (HERE), and (HERE). this Gizmodo article (HERE) to find out. would have us believe; go (HERE) for more. nothing else to think about, then consider the "trolley problem" (HERE). 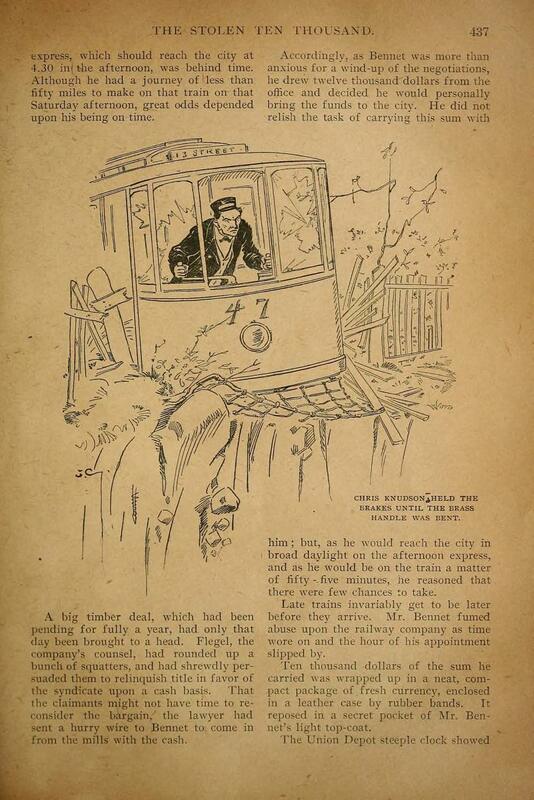 The bottom line: "Trams and dusty trees." "I Fired Again, and the Universe Disintegrated"
By Samuel Hopkins Adams (1871-1958). First appearance: Munsey's Magazine, September 1901. Reprinted in The Underworld, October 5, 1927. "I took the revolver and the hand, both, and with them a resolution." But for the presence of the little black satchel, the next four days would have been unalloyed paradise. Whenever I looked into Mildred Gaylord's eyes my heart came into my throat; whenever I looked at that funereal black cube of concentrated cussedness, it went down into my boots. Cardiac fluctuations are professionally regarded as unhealthy, I believe. I began to get morbid over it; to wonder what Mildred would do if she knew the secret shut up in that satchel. Would she content herself with shunning me like a pestilence? Or would she denounce me to the conductor, in which case I should be ejected from the train at the next stop with a reputation that would close every hotel in the place against me? And then, while Ellis is brooding over what to do about his dilemma, fate steps in . . . Comment: A delightful vignette with a couple of surprising plot twists and a satisfying, frantic finale. - A muckraker in his day, Samuel Hopkins Adams also produced readable fiction on the side, both in the crime fiction and SFF genres; see Wikipedia (HERE), the SFE (HERE), and the ISFDb (HERE). The bottom line: "Love will find its way through paths where wolves fear to prey." "What Would Sherlock Holmes Do?" 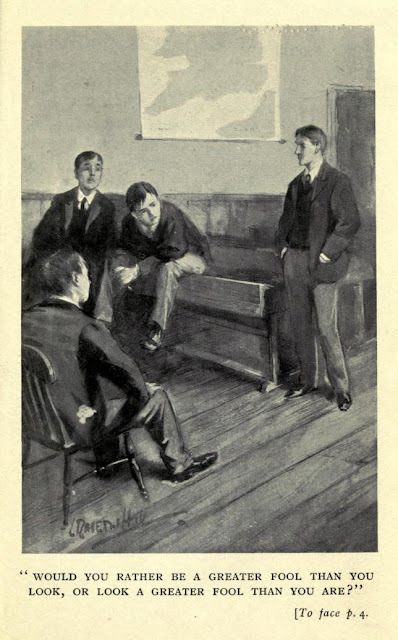 First appearance: The Windsor Magazine, June 1907. 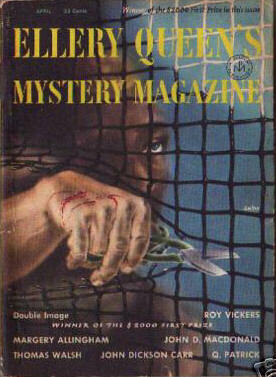 Reprinted in Smith’s Magazine, September 1907; Ellery Queen’s Mystery Magazine, April 1954; and Ellery Queen’s Anthology #18, 1970. 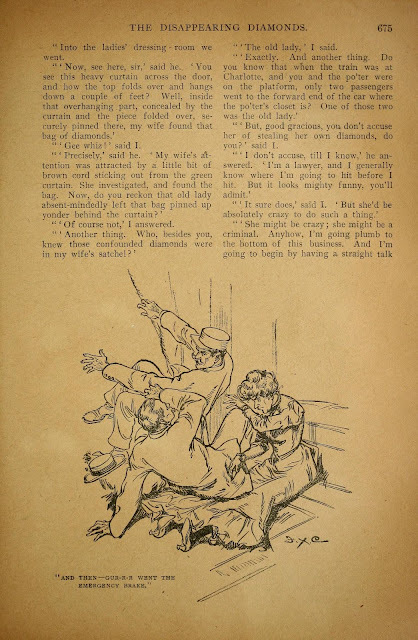 Collected in The Human Boy Again (1908, pages 3-30). Online at Google Books (HERE) and Project Gutenberg (HERE). 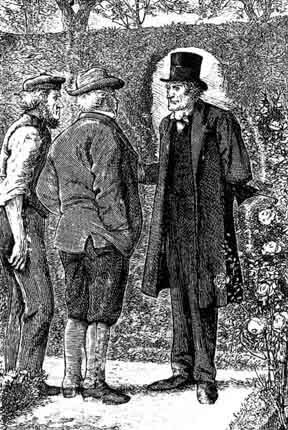 "He could hardly speak for excitement, and forgot to put his hands like Holmes, or to try and arrange a 'far-away' look on his face, or anything." "What are you going to be?" Gideon asked; and then came out the startling fact that Peters hoped to be a detective of crime. "If you go detecting anything here you'll get your head punched," said Shortland. "I may or I may not," answered Peters. "But it's rather useful sometimes to have a chap in a school who has made a study of detecting things." "He is founded on fact—in fact, founded on thousands of solemn facts," said Peters. "The things he does are all founded on real crimes, and if anybody is going to be a detective, he can't do better than try to be like Sherlock Holmes in every possible way." And that's exactly what Peters does, model himself on Holmes, which in itself is a harmless enough exercise ("A few small detections he made with great ease"), but then suddenly two mysteries crop up. happen that both came out in the same minute. "I suspect most mystery fans know Phillpotts, if they know him, for his having encouraged a young Torquay neighbor, Agatha Christie, with her writing career. When a hugely successful writer herself, Agatha Christie retained fondness for the older author who had given her youthful writing promising words of praise. When Phillpotts died in 1960, at the advanced age of 98, Christie penned an affectionate obituary of him . . ." — Curt Evans, "Rather a Shocker," The Passing Tramp (October 25, 2014) (HERE). did not know about bloodstains would have filled a library." "According to My Private Canons It Is Not a Pure Detective Story"
That T. S. Eliot, of all people, was a devoted fan of the genre must have rankled [snobbish super-highbrow critic Edmund] Wilson in particular. Eliot, the author of famously difficult and formidably learned poems, whose every critical pronouncement was seized upon by dons and converted into doctrine, was an unimpeachable authority in matters of literary judgment. Wilson, indeed, had played a part in establishing Eliot’s reputation as such, having gushed, in his era-defining study “Axel’s Castle” (1931), that the poet-critic had an “infinitely sensitive apparatus for aesthetic appreciation”—a sensitivity presumably not worth squandering on something as puerile and formulaic as mysteries. I was glad to get your letter of the 31st March, and particularly because it clears up the mystery of your mystery stories. 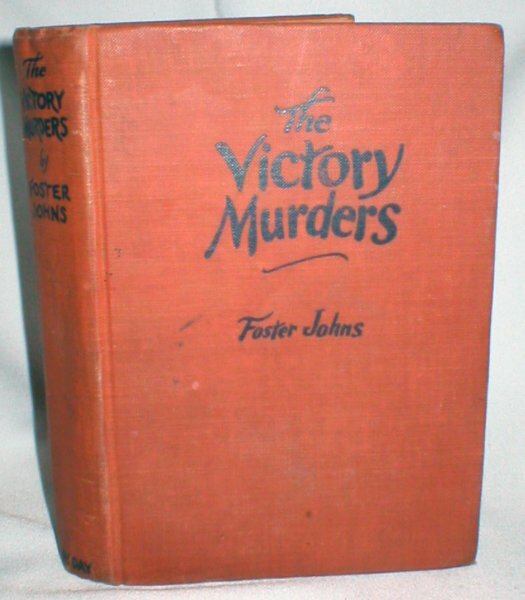 It is needless to say that I had read 'The Victory Murders' within 24 hours of receipt, and had been speculating on the identity of the author without success. I have enjoyed the book very much; my only criticism is that according to my private canons it is not a pure detective story, but a mixed detective and adventure story. That is to say, in a pure detective story there are no adventures after the first chapter; the book is entirely concerned with the accumulation, selection and construction of evidence about something which has already happened. In your story things keep happening. This is by no means a disadvantage; it is merely a nice point of definition. I am perfectly willing to admit that the pure detective story is extremely rare; the most austere example of the type is of course The Case [sic] of Marie Roget. A mystery story of International interest set in France, England, and America. The motive for the deaths of famous actresses which always occur or are threatened on Armistice Night is carefully concealed until the end of the story. "What Makes Great Detective Fiction, According to T. S. Eliot." First appearance: The New Yorker, February 2, 2016. 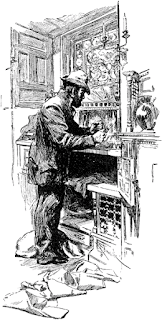 A key tenet of Golden Age detection was “fair play”—the idea that an attentive reader must in theory have as good a shot at solving the mystery as the story’s detective. 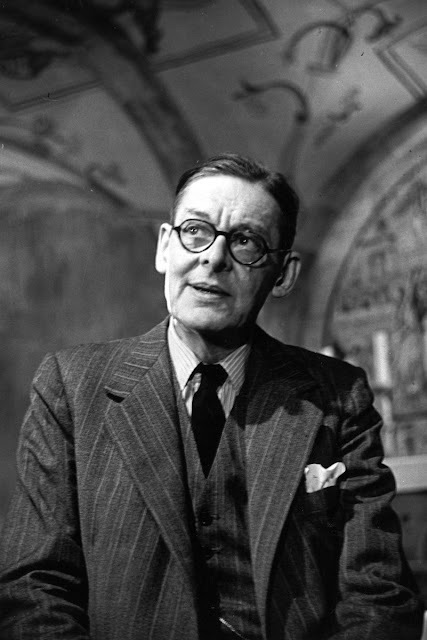 To establish parameters of fairness, Eliot suggests that “the character and motives of the criminal should be normal” and that “elaborate and incredible disguises” should be banned; he writes that a good detective story must not “rely either upon occult phenomena or . . . discoveries made by lonely scientists,” and that “elaborate and bizarre machinery is an irrelevance.” The latter rule would seem to exclude masterpieces like Doyle’s “The Adventure of the Speckled Band,” which involves a murder carried out by a snake trained to shimmy through a heating duct, then down a bell rope whose tassel extends to the victim’s pillow. But Eliot admitted that most great works broke at least one of his rules. 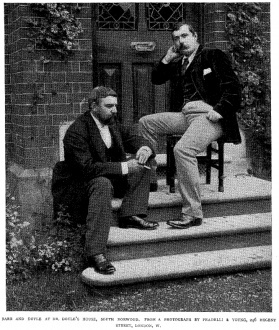 He in fact adored Arthur Conan Doyle, and was given to quoting long passages from the Holmes tales verbatim at parties, and to borrowing bits and ideas for his poems. 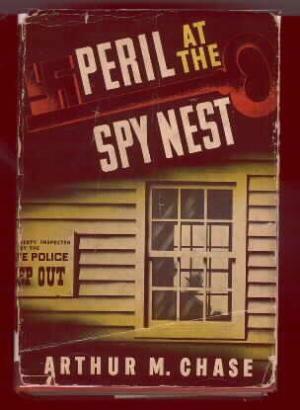 During the last year or two the output of detective fiction has increased rapidly. I presume that detective fiction is successful, with a rising demand; otherwise one or two such thrillers would not appear on nearly every publisher’s list. It might be interesting to speculate on the reasons for this increased demand, but our conclusions would be undemonstrable. What can be shown, and is of interest in itself, is that the increased demand and competition is producing a different, and as I think a superior type of detective story; that some general rules of detective technique may be laid down; and that, as detective fiction observes the rules of the game, so it tends to return and approximate to the practice of Wilkie Collins. 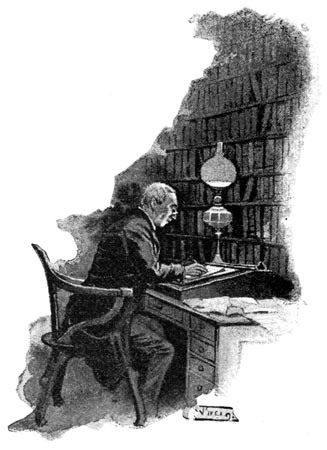 For the great book which contains the whole of English detective fiction in embryo is The Moonstone; every detective story, so far as it is a good detective story, observes the detective laws to be drawn from this book. 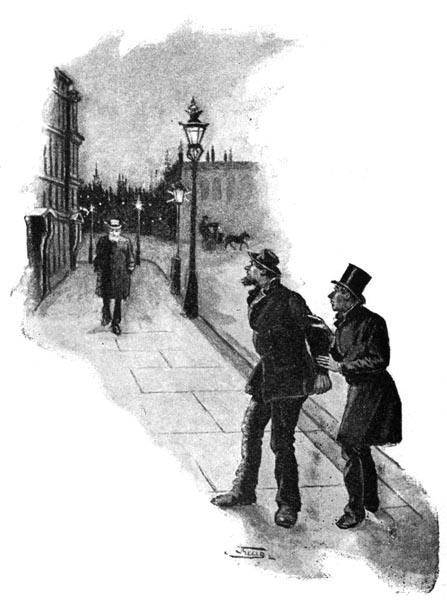 The typical English detective story is free from the influence of Poe; Sherlock Holmes himself, and in spite of his numerous progeny, is in some important respects a sport. I say the ‘typical’ English detective story, because I believe that the crime fiction of every country has its own national character: it would be interesting, in this connexion, to show how French crime stories – notably Arsène Lupin and Jacques Rouletabille – may be derived from The Count of Monte-Cristo in the same way that English fiction is derived from The Moonstone; but that would lead us too far. A detective story cannot be analysed like other fiction: the reviewer must not reveal the plot, or the reader will be robbed of his pleasure. I have therefore arranged the fiction here ‘reviewed’ – a small, but I dare say representative selection from the season’s product – as nearly as possible in what I think the order of merit. The Massingham Butterfly must be considered hors de concours, as it proved to be merely a collection of unrelated short stories of detective type; they are too slight to deserve reprinting, but suggest that Mr Fletcher’s longer detective stories are probably very good. 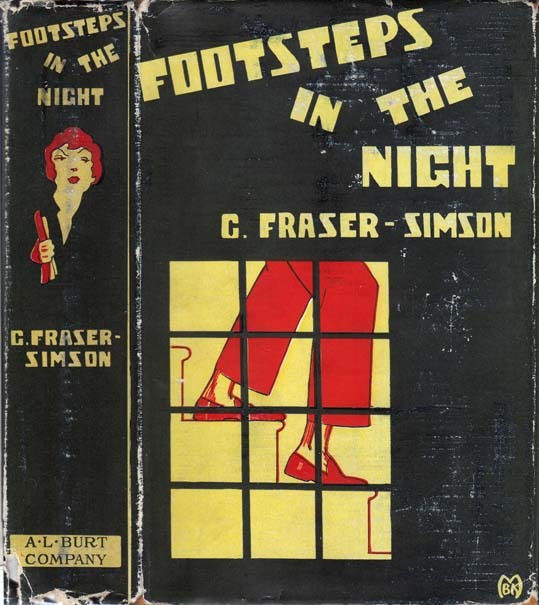 The two preceding (Footsteps in the Night and The Bishops Park Mystery) are not properly detective stories either, because they have no detectives; therefore they are technically of little interest. All of the rest have some merit: all of them violate, as Wilkie Collins never violates, some obvious rule of detective conduct. ". . . technically of little interest." (1) The story must not rely upon elaborate and incredible disguises. We accepted them from so engaging a character as Holmes, as we accept them from the more farcical Lupin: but we consider them to be trick work. Disguises must be only occasional and incidental: here Wilkie Collins is impeccable. 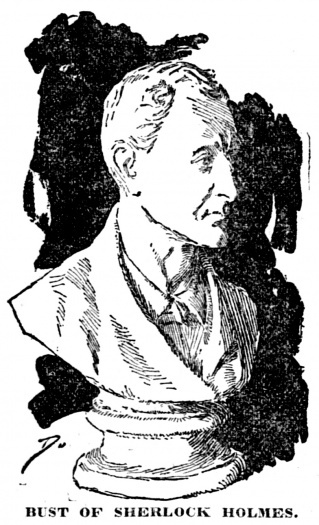 Elaborate double lives, in disguise, are an exaggeration of this vice: Arsène Lupin disguised for four years as the head of the Paris police, and actually being the head of the police, is admirable fooling. But in general it is reprehensible. But for a device of this sort, The Footsteps that Stopped would be the best of our list. (2) The character and motives of the criminal should be normal. In the ideal detective story we should feel that we have a sporting chance to solve the mystery ourselves; if the criminal is highly abnormal an irrational element is introduced which offends us. If the crime is not to have a natural motive, or is without motive altogether, we feel again that we have been tricked. But for this fault, another story on my list would have been placed higher than The D’Arblay Mystery. No theft, for instance, should be due to kleptomania (even if there is such a thing). (3) The story must not rely either upon occult phenomena, or, what comes to the same thing, upon mysterious and preposterous discoveries made by lonely scientists. This, again, is the introduction of an irrational element: ghosts, influences, strange elements with terrifying properties (‘the destruction of the atom’ will probably flourish for several years in bad detective stories) are all in the same category. 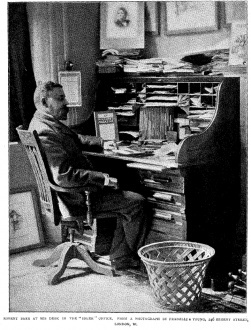 Writers of this sort of hocus-pocus may think that they are fortified by the prestige of H. G. Wells. But observe that Wells triumphs with his scientific fiction just because he keeps within the limits of a genre which is different from the detective genre. The reality is on another plane. In detective fiction there is no place for this sort of thing. Two of our list fall through this sin. (4) Elaborate and bizarre machinery is an irrelevance. Detective writers of austere and classical tendencies will abhor it. Some of the Sherlock Holmes stories make far too much of stage properties. Writers who delight in treasures hid in strange places, cyphers and codes, runes and rituals, should not be encouraged. But we must distinguish carefully. In Poe’s Gold Bug the cypher is good, because we are given the legitimate intellectual exercise of its explication; there is nothing sham or meretricious about it, but the gold bug itself, and the skull, are unnecessary and childish trappings. 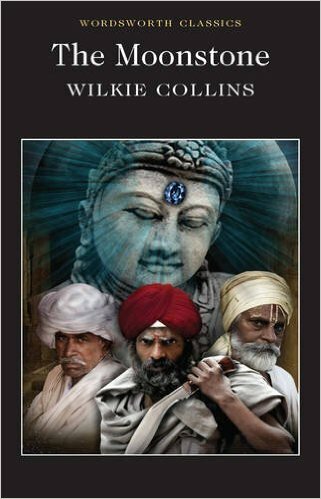 But in The Moonstone, the Indian business (though I fear it has led to a great deal of bogus Indianism, fakirs and swamis, in crime fiction) is perfectly within the bounds of reason. Collins’s Indians are intelligent and resourceful human beings with perfectly legitimate and comprehensible motives. ". . . perfectly within the bounds of reason." (5) The detective should be highly intelligent but not superhuman. We should be able to follow his inferences and almost, but not quite, make them with him. It is perhaps in the Detective that the contemporary story has made the greatest progress – progress, that is to say, back to Sergeant Cuff. I am impressed by the number of competent, but not infallible professionals in recent fiction: Scotland Yard, or as it is now called, the C. I. D., has been rehabilitated. The amateur detective no longer has everything his own way. Besides the C. I. D. Inspector, another type is successful: the medical scientist whose particular work brings him into touch with crime. But Mr Freeman’s Dr Thorndyke and Mr Upward’s Dr Tarleton are also unpretentious professionals; they have personality, but are without extraneous trappings. 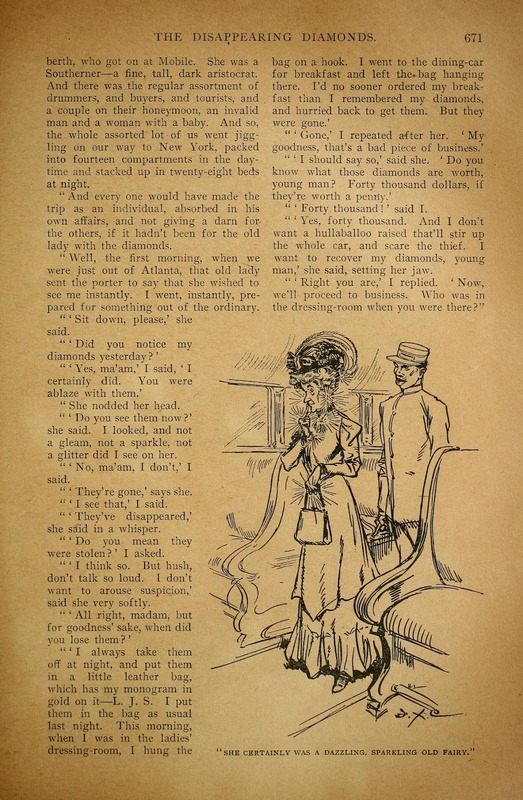 One of the most brilliant touches in the whole of detective fiction is the way in which Sergeant Cuff, in The Moonstone, is introduced to the reader (in the narrative of the butler Betteredge). He is unimpressive, and dreary. But suddenly, while he is talking to the gardener about roses, ‘Hello,’ he says, ‘here’s a lady coming. Might it be Lady Verinder.’ Now Betteredge and the gardener had reason to expect Lady Verinder, and from that direction; Cuff had not. Betteredge begins to think better of Cuff. It is not that Cuff has superhuman powers; he has a trained mind and trained senses. ". . . progress, that is to say, back to Sergeant Cuff." One of the most promising of the younger detectives is Inspector Gilmour in The Mysterious Disappearances. He is all the better for being rather a disagreeable person, and his peculiar talents and limitations are very lifelike. If the author will abandon his scientific trickery (error 3 above) there is a brilliant future for Inspector Gilmour. 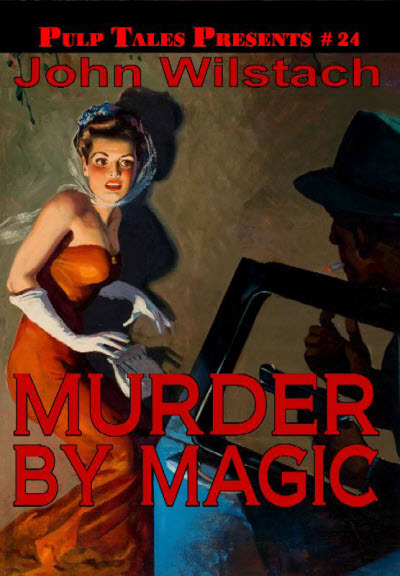 Of all of the stories named above, The D’Arblay Mystery is the most perfect in form. The second is the most remarkable in its complication of plot; and only towards the end becomes improbable; the third is also first-rate work. The rest are inferior to these three. - He may have been a critic with an elevated brow, but Gilbert Seldes was also a fan of detective fiction; go to ONTOS (HERE) and (HERE). 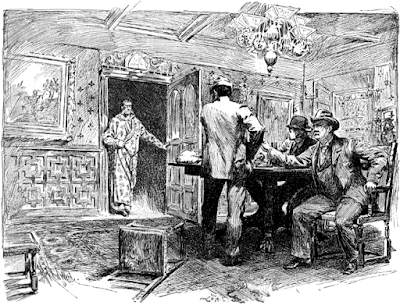 "I Shall Never Write Another Holmes Story"
IF YOU'VE READ much detective fiction from the Gaslight Era, then you know who Robert Barr was, the author of one of the most anthologized stories in mystery fiction ("The Absent-Minded Coterie," 1905), a tale which features to great advantage his series character Eugène Valmont, star of a baker's dozen adventures (1904-06). The only fault that I have to find with these Real Conversations is that they are not conversations, and that they cannot be real. Try to imagine two sane men sitting down deliberately to talk for publication! Only a master mind could have conceived such a situation—a mind like that of Mr. McClure, accustomed to accomplishing the impossible. 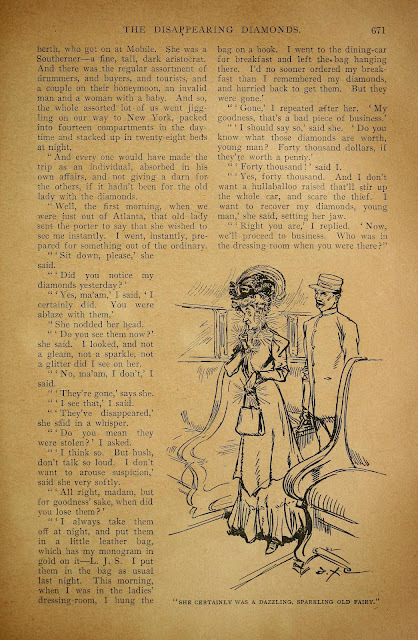 "Real Conversations V - A Dialogue Between Conan Doyle and Robert Barr." 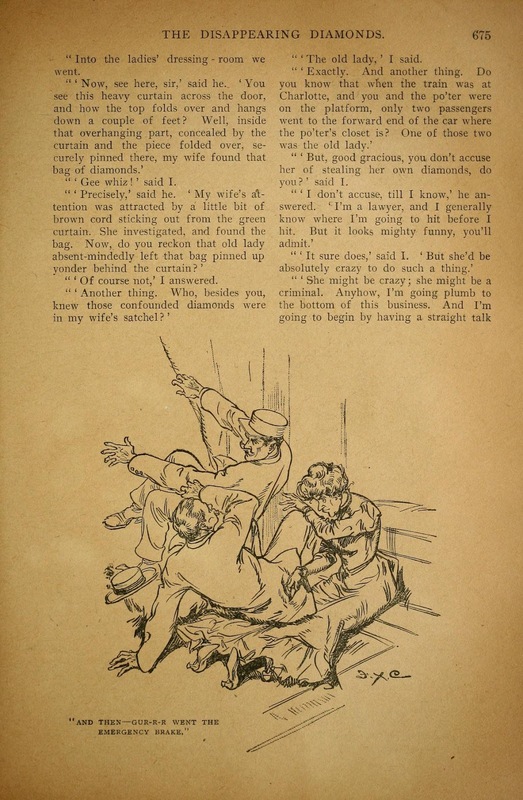 First appearance: McClure's Magazine, November 1894. Article (11 pages, with 12 illos). "To get an idea to penetrate to the masses of the people, you must put fiction round it, like sugar round a pill. If he [the author] can't get his sugar right, people will refuse his pill." Barr: "But there is the question of art." Doyle: "We talk so much about art, that we tend to forget what this art was ever invented for. It was to amuse mankind—to help the sick and the dull and the weary. If Scott and Dickens have done this for millions, they have done well by their art." Barr: "You don't think, then, that the object of all fiction is to draw life as it is?" Doyle: "Where would Gulliver and Don Quixote and Dante and Goethe be, if that were so? No; the object of fiction is to interest, and the best fiction is that which interests most. If you can interest by drawing life as it is, by all means do so. But there is no reason why you should object to your neighbor using other means." On the bookcase in the study there stands a bust of a man with a keen, shrewd face. "Who is the statesman?" I asked. "Oh, that is Sherlock Holmes," said Doyle. "A young sculptor named Wilkins, from Birmingham, sent it to me. Isn't it good?" "Excellent. By the way, is Sherlock Holmes really dead?" "Yes; I shall never write another Holmes story." But he did . . . HERE WE HAVE something of a rara avis, a locked room murder rendered in science fictional terms. Given that it is SFF, is it possible for it to play fair with the reader? Decide for yourself. By George O. Smith (1911-81). 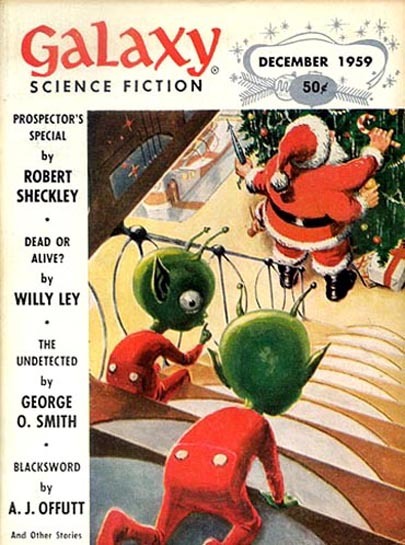 First appearance: Galaxy, December 1959. Online at Archive.org (HERE) (text faded), Project Gutenberg (HERE), and Socialpolitan (HERE). "Nothing can possibly be more baffling than a crime in a sealed room . . . but what if the investigator happens to have an open mind?" I took a quick look around the apartment, even though I already knew what I had to know. 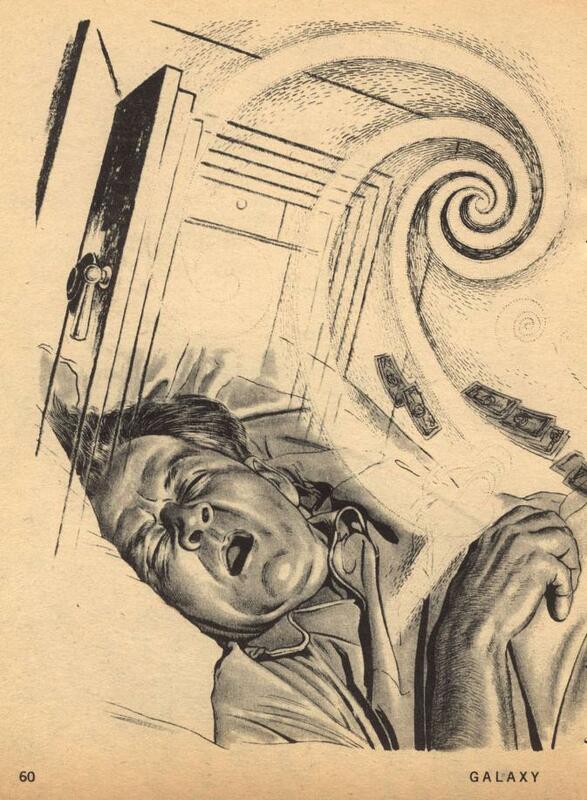 Gordon Andrews had been slain in his sleep by the quick thrust of some rapierlike instrument. There was no sign of any struggle. The wall safe stood with its door open and its contents missing. Every door and window was closed, locked, burglar-bugged, and non-openable from the inside; the front door had been forced by the police. Furthermore, it had been raining in wind-whipped torrents for hours, yet there was no trace of moisture on any of the floors. Of course no one had heard a sound, and naturally there were no fingerprints. Police Chief Weston spied me and snapped, "What do you make of it, Schnell?" I shrugged and said, "Completely sealed room." 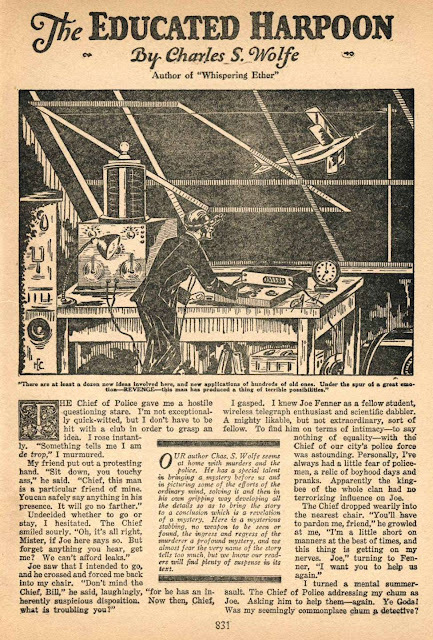 With about ninety-eight per cent of the general public still not quite willing to accept rockets, missiles and space travel, I had a fat chance of convincing anybody that a telepath had kept guard over the slumbering mind of Gordon Andrews, while a perceptive solved the combination to the wall safe, so that a kinematic could twirl the dial; that the imminent awakening of Gordon Andrews had indeed been an imminent physical threat to a delicate extra-sensory under-taking, and that therefore he had been silenced by the kinematic, with a weapon located by the perceptive, after warning from the telepath; after which the crime had continued, with the loot being floated by a levitator along a freeway explor-ed by the perceptive and scouted by the telepath and cleared of barriers by the kinematic who opened and debugged them as he went along—and that the real topper for this whopper was that this operation was not the integrated effort of a clever gang of extra-sensory specialists, but rather the single-handed accom-plishment of one highly talented Psi-man! A Psi-man ruthless enough to kill before he would permit his victim to watch the turning dial, the floating loot, the opening portal, simply because there stood a probability that one of the two billion persons on Earth might suspect the phenomena as parapsychical activity, instead of the hallucinatory ravings of a rich old eccentric who hated the incumbent political party! if anybody gets too close to the truth . 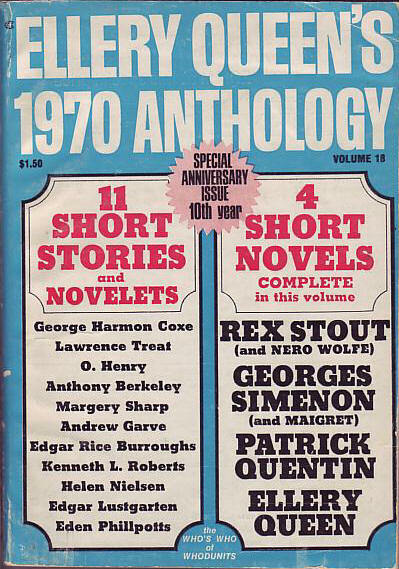 . .
- George O. Smith belonged to the next generation of SFF authors following Hugo Gerns-back; see Wikipedia (HERE), the SFE (HERE), and the ISFDb (HERE) for just about all that's known about him. 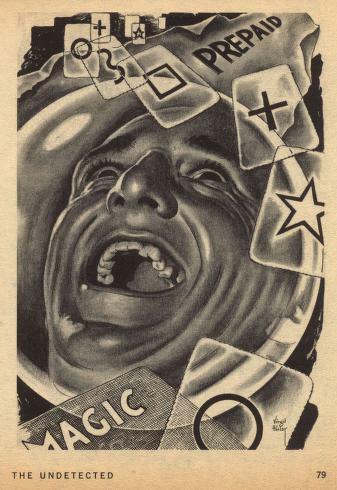 - If you're interested in psionics, we can't think of a better introduction to it than the Atomic Rockets website (HERE). The bottom line: "In science fiction, telepaths often communicate across language barriers, since thoughts are considered to be universal. However, this might not be true. Emotions and feelings may well be nonverbal and universal, so that one could telepathically send them to anyone, but rational thinking is so closely tied to language that it is very unlikely that complex thoughts could be sent across language barriers. Words will still be sent telepath-ically in their original language." "Would You Like to See a Murder Done?" By E. J. Goodman (1836-1921?). 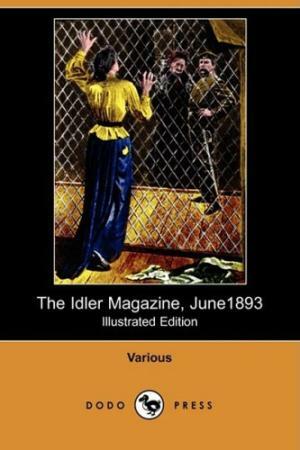 First appearance: The Idler Magazine, June 1893. "What do you know of crime?" When I say that my name is Samuel Chillip, of course you will know who I am. Yes, I am the author—it has been said the famous author—of “The Poisoned Waterbottle,” “Steeped in Gore,” “The Demon Detective,” and other highly sensational and blood-curdling stories. But though these tales of mine have brought me some fame and a fair amount of profit, I am not particularly proud of them. I really don’t know how I, so to speak, drifted into crime. I never liked it, and, of course, never practised it myself. I would much rather have written sentimental or moral stories, but I seemed somehow fated to turn my attention to fraud and violence, and I could not get away from such subjects. Nothing out of the usual course had happened on the memorable evening of which I am about to tell, and which was destined to have so marked an influence on my literary career. Because there in his seemingly safe and secure study Samuel is about to be forced to consider a question he never thought he'd have to answer: "Would you like to see a murderer?" "Paid in His Own Coin." By E. J. Goodman. Three Vols. (Richard Bentley and Son.) At the present moment, when the horrors of the East End have whetted the taste for, and the interest in, mysterious murders, the present story ought to prove attractive. A young medical man is accused of having caused the death of his father-in-law by administering some strange narcotic, unknown to the medical world, and two drops of which cause a deep sleep, ending in death. The story opens on the scene in the law courts at the end of the trial of Dr. Wynd for murder. He is acquitted for want of evidence, but the uncharitable public declines to believe in his innocence. 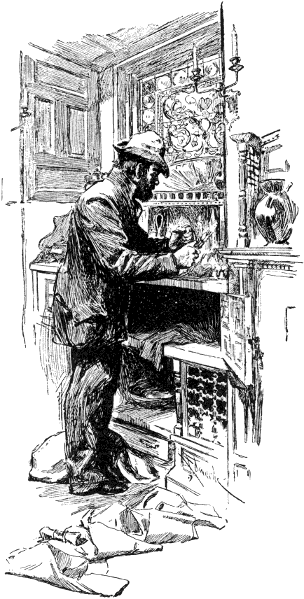 A gaunt, red-haired fellow who day after day has watched the case with keenest interest - his one interest in life being the study of cases of "scientific" murder - dogs the footsteps of the accused man, and eventually discovers that the latter is indeed the perpetrator of the crime, and is paid in his own coin by being killed in his turn. So far, so well; and if the outline of a plot could make a tale successful there is no reason why the author should not have written a readable book. But after it has been said that the plot is not bad, there remains absolutely nothing more to be said in praise of the novel. Among the puppets who are dragged before the public to represent the "characters" there is not a single one which can boast of possessing an average quantity of common sense or intelligence; and never for a moment is it possible for a reader to have a fellow-feeling for any of the imbecile creatures crawling along towards the final denouement with all its sensational absurdities. - Our story shouldn't be confused with Richard Hull's 1941 novel (HERE) and (HERE). The bottom line: "The Edge . . . There is no honest way to explain it because the only people who really know where it is are the ones who have gone over."